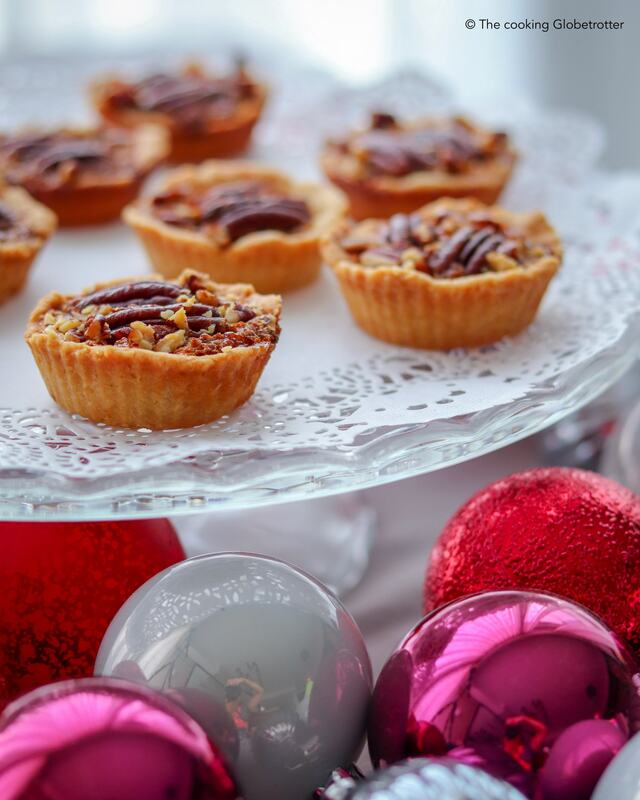 A slice of Pecan Pie is a wonderful treat! 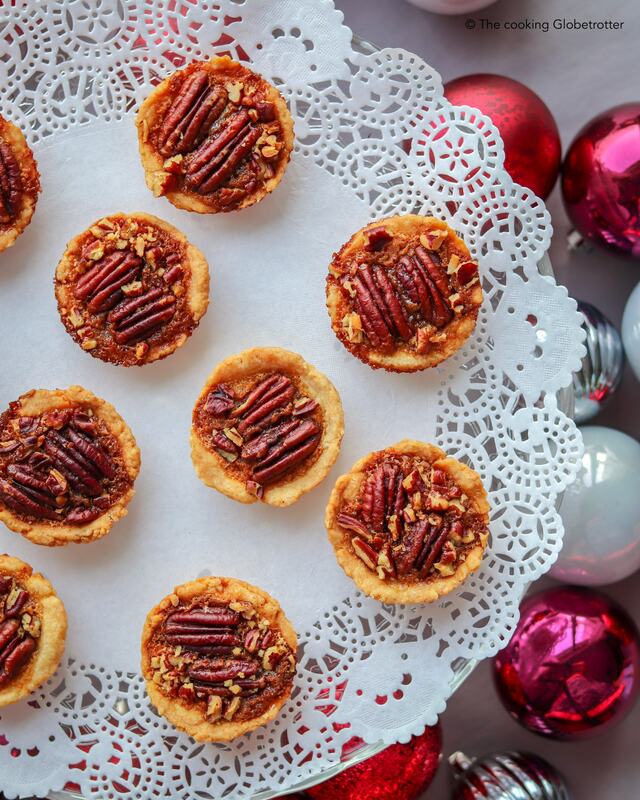 Pecan nuts are crunchy, tasty, nutty and look beautiful too! But a whole pie might be too much, so I decided to make single portions using silicon muffin forms and used less filling as it tends to be too sweet for me. Now that they are almost bite-size, I can also add them to my Christmas cookies plate. Don’t they look lovely? Believe me, they taste even better! I used a recipe that I found in one of my favourite cookbooks, as it is a collection of recipes from all over the world, written by many of my culinary sisters (as I love to call them) from the International Cooking Club Singapore. The book is called “The red dot melting pot” and can be ordered online (no affiliation, this is a non-profit organisation). I adapted the recipe slightly to my needs and taste, as I always do. This one will make about 30 mini pies, depending on the size of your muffin tins. If you wish to do just 12-15 mini pies, cut the quantities in half. In a bowl mix together flour (280g), sugar (20g) and salt (4g). Add the cold butter (175g) cut in small pieces an mix. Now add the egg and one tablespoon of cold water. You might need to mix by hand now to form the dough, stop as soon as it sticks all together. Grease the muffin forms (or any other mould of your choice) with non-stick spray or melted butter. Preheat the oven at 170° on ventilation mode. Take a piece of dough and press it in the muffin tin with your fingertips and make a small cup in it. Whisk well the eggs (2) and sugar (100g) in a bowl. Add a splash of vanilla extract, the corn syrup (120g), and the melted butter (70g, room temperature) and mix well. 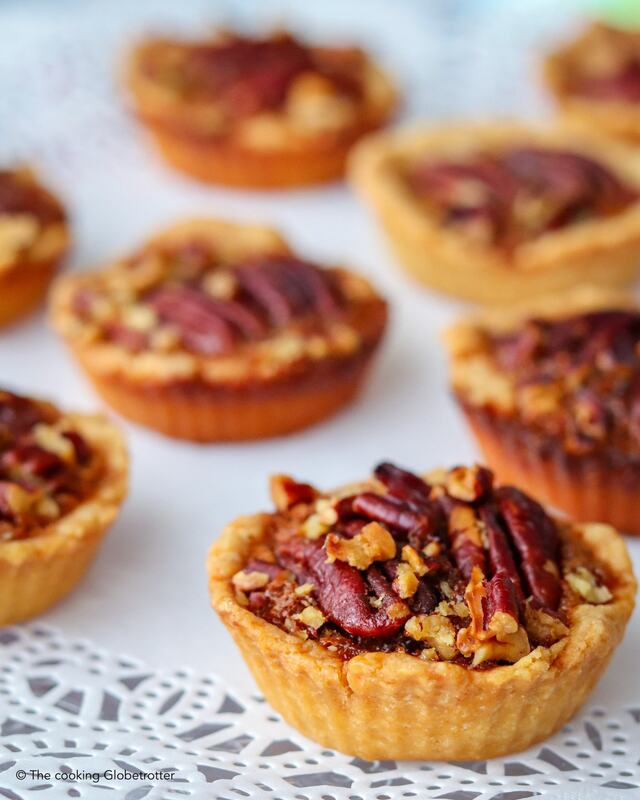 Now use a tablespoon to pour the filling in your half-baked mini pie crusts and top them with pecan nuts (I like to use one or two whole ones and then some broken ones to fill the gaps). Let them cool down 5 minutes, remove from the tins (I suggest silicon as it makes this step really easy) and let cool completely on a rack. Do you love the idea of mini portions? Then check out my buttermilk mini cakes here! 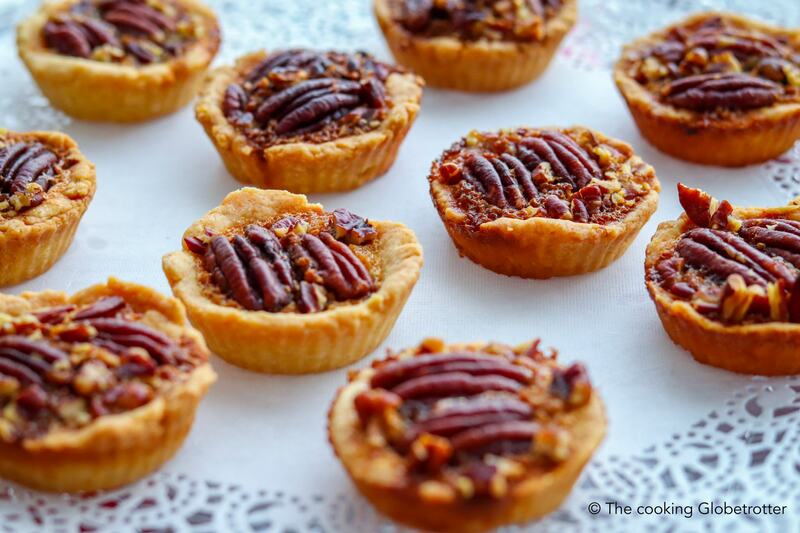 Be serving a raw vegan pecan pie for Xmas but these little fellows here just look to cute ! Isn’t it an amazing dessert? I love it and here I managed to keep it more nutty then sweet! Your version is also totally interesting! Are you going to share the recipe? Die schauen super lecker aus.Habe ich selbst noch nie ausprobiert aber das werde ich jetzt auf jeden Fall mal machen. Vielen Dank Alex! Pecan pie ist ein Traum! Vielen Dank Corinna! Hoffe sie schmecken dir!